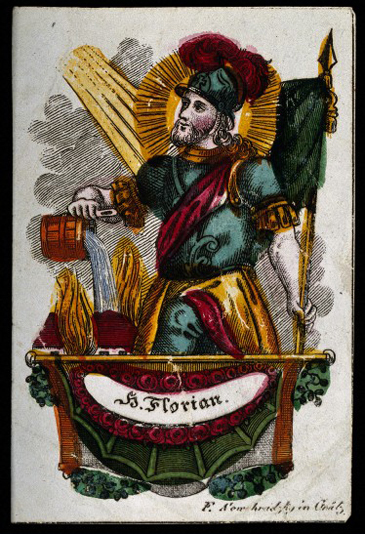 Thanks to Ross MacFarlane from The Wellcome Library--one of our esteemed contributers to the Morbid Anatomy Anthology Volume 1--for sending along an even better image than that last of St. Florian, patron saint invoked against fire, floods and drowning. As the winds rage and the water beats against my flimsy 6th-floor window, fingers crossed that this magical thinking helps! Image info: Saint Florian. Coloured engraving by F. Nowohradsky, The Wellcome Library. More here.